U.S. businesses lost a total of $5.5 million in 2011 from data breaches, according to the 2011 Cost of Data Breach Study: United States conducted by Symantec Corporation and Ponemon Institute. While those numbers are a slight decrease than what we’ve seen in years past, they are still huge dollars lost. Part of the decrease is the result of a concerted effort to educate businesses about the risks involved in mobile devices for data breaches and the increasing penalties assigned to businesses that are negligent in their responsibility to protect customer data as well as their own privacy. 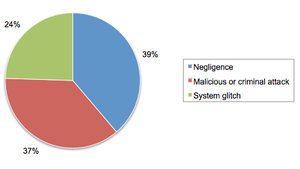 1) Employee Carelessness (39%) – This comes in the form of theft, negligence, misplaced equipment, etc. Laptops and mobile devices disappear from the hands of employees in many ways. That disappearance, in turn, leaves them vulnerable to people who have less than noble intentions. 2) Malicious Attacks (37%)– These attacks are often carried out via malware, spyware, phishing, web-based attacks, and computer viruses. They can do anything from stealing information from your mobile devices to shutting them down completely so that they aren’t accessible by your employee, your business, or anyone else. According to the Symantec and Ponemon study, criminal acts and malicious attacks increased more than 30 percent from 2010 to 2011. 3) System Malfunctions (24%) – Then there is the old “blue screen of death” people still break out into cold sweats of remembrance over. Sometimes, the system just gives out for whatever reason and the information it held is lost forever. Alternatively, it doesn’t give out completely, but does gobble up some of the information (kind of like clothes dryers gobble up socks). It’s a mystery sometimes – but one that can cost your company dearly. What Can You Do to Mitigate Data Breach Risks in Your Business? The good news is that there are things you can do that will limit your exposure if, and when, data breaches occur. Here are a few things you’ll want to consider for your business to put it in a less vulnerable position where data breaches are concerned. Install USB locks on all laptops so that unauthorized transfers cannot be made via USB ports with thumb drives. Create actionable policies concerning mobile devices. Educated your staff about these policies and enforce them strictly. Install GEO location software on mobile devices that can ping the location of missing devices and, if need be, lock the device and/or wipe its memory. Protect your mobile devices from malware and viruses with the appropriate software. Keep this software updated regularly. Make sure employees store important information for your business in the cloud rather than on individual devices. No matter how much planning and training you do to prevent data breaches on your mobile devices, the risk will always remain. Hackers are becoming more and more technologically savvy by the day. That’s why it’s so important to purchase a suitable technology insurance policy to cover your business from liabilities that could result from these breaches. This entry was posted in Technology. Bookmark the permalink. Follow any comments here with the RSS feed for this post. Both comments and trackbacks are currently closed.